The Oilholic finds himself in the 'Granite City' or the 'Oil capital of Europe' as Aberdeen, Scotland has recently come to be known as. 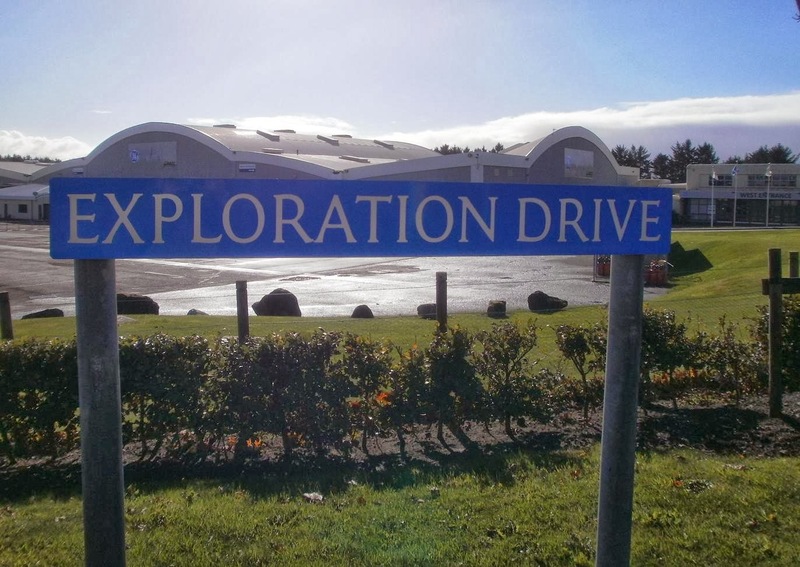 Given that context, a street named Exploration Drive in the city's Energy Park has a nice ring to it. In what has been an interesting week – news-wise, market reports-wise and otherwise – right up to this morning, it's good to be here, meeting old friends and making yet newer ones during been. While this blogger's flight got in on time, blustery conditions so common in this part of the world saw one plane overshoot the runway and the airport closed for a few hours. That wasn't the only news in town. Reports of the Libyan PM first getting kidnapped and then released, flooded the wires and Shell – Nigeria’s oldest IOC operator – has put up four oil blocks there feeding the Bonny Terminal (the country’s oldest export facility) up for sale, according to the FT. The chatter, if formally confirmed, would be seen as a retreat by the oil major from a part of the world where theft of crude from pipeline infrastructure is rampant. Shell it seems is getting mighty fed up of constant damage to its pipelines. Moving on from news, it is worth summarising a couple of interesting notes put out by Moody's these past few weeks. In the first, the ratings agency opines that BP can tolerate a moderate penalty related to the 2010 Gulf of Mexico oil spill without compromising its credit quality. However, a severe penalty resulting from a finding of gross negligence would change the equation according to Moody's, with Phase 2 of the trial to determine limitation and liability having begun stateside. "BP can tolerate about US$40 billion in penalties, after taxes, under its A2, Prime-1 ratings. A ruling in line with the company's current $3.5 billion provision would leave some headroom to absorb other charges, including settlement costs from payouts awarded for business economic loss claims, which ultimately depend on the interpretation of the Economic and Property Damages Settlement Agreement," Moody's noted. Other defendants in the case include Transocean, Halliburton and Anadarko. Of these, Transocean, which owned the Deepwater Horizon rig, is exposed to sizable fines and penalties. "Indemnifications will protect Transocean from some liabilities. But other items could ultimately cost the company billions of dollars to resolve," says Stuart Miller, senior credit officer at Moody's. In its second note, the ratings agency said it had downgraded Petrobras' long term debt ratings to Baa1 from A3. The downgrade reflects Petrobras' high financial leverage and the expectation that the company will continue to have large negative cash flow over the next few years as it pursues its capital spending programme. With that programme being the largest among its peers, Petrobras' spending in 2013 could be almost double its internally generated cash flow. The company's total debt liabilities increased in the first half of 2013 by $16.3 billion, or $8.36 billion net of cash and marketable securities, and should increase again in 2014, based on an outlook for negative cash flow through 2014 and into 2015. The outlook remains negative, Moody's adds. Moving away from companies to countries, global analytics firm IHS has concluded that North America’s "Tight Oil" phenomenon is poised to go global. In its latest geological study – Going Global: Predicting the Next Tight Oil Revolution – it says the world has large 'potential technical' recoverable resources of tight oil, possibly several times those of North America. In particular, the study identified the 23 "highest-potential" plays throughout the world and found that the potential technically recoverable resources of just those plays is likely to be 175 billion barrels – out of almost 300 billion for all 148 play areas analysed for the study. While it is too early to assess the proportion of what could be commercially recovered, the potential is significant compared to the commercially recoverable resources of tight oil (43 billion barrels) estimated in North America by previous IHS studies. The growth of tight oil production has driven the recent surge in North American production. In fact, the USA is now the world largest 'energy' producer by many metrics. "Before the tight oil revolution people thought oil supply would start to fall slowly in the longer term, but now it is booming. This is important because Russian production has been hovering at the same level for some time, and now the US will exceed the Russia’s total oil and gas production," says Peter Jackson, vice president of upstream research at IHS CERA. In IHS' view, Russian oil production is unlikely to rise in the medium term. In fact, the firm anticipates that it will start falling because of the lack of investment in exploration in emerging areas such as the Arctic and new plays such as tight oil. "But of course, there is a long lead time between deciding to invest and exploring and then getting that oil & gas out of the ground," Jackson adds. North America's growth in supply from the tight oil and shale revolution means that the USA is now less worried about the security of energy supply. It is now even thinking of exporting LNG, which would have been unheard of ten years ago, as the Oilholic noted from Chicago earlier this year. This is having an impact on the direction of exports around the world changing direction, from West to East, for example to China and post-Fukushima Japan. Furthermore, light sweet West African crudes are now switching globally, less directed to the US and increasingly to Asian jurisdictions. OPEC, which is likely to increase its focus in favour of Asia as well, published its industry outlook earlier this month. While its Secretary General Abdalla Salem el-Badri refused to be drawn in to what production quota it would set later this year, he did say a forecast drop in demand for OPEC's oil was not large. The exporters' group expects demand for its crude to fall to 29.61 million bpd in 2014, down 320,000 bpd from 2013, due to rising non-OPEC supply. "Tight oil" output would be in decline by 2018 and the cost of such developments means that a sharp drop in oil prices would restrain supplies, Badri said. "This tight oil is hanging on the cost. If the price were to drop to $60 to $70, then it would be out of the market completely." He does have a point there and that point – what oil-price level would keep unconventional, difficult-to-extract and low-yield projects going – is what the Oilholic is here to find out over the next couple of days. That’s all for the moment from Aberdeen folks! Keep reading, keep it 'crude'! © Gaurav Sharma 2013. Photo 1: Exploration Drive, Aberdeen, Scotland, UK. Photo 2: Weatherford site, Aberdeen Energy Park, Scotland, UK © Gaurav Sharma, October 2013.